It’s a frustrating fact that dollar for dollar eating organic on a budget can be very difficult. It’s more expensive to buy an organic apple versus one that’s been sprayed with pesticides. This is a double-edged sword as we now know we should be consuming 9-13 fist sized servings of fresh produce, and that it should of course be as far from chemical-laden as possible. 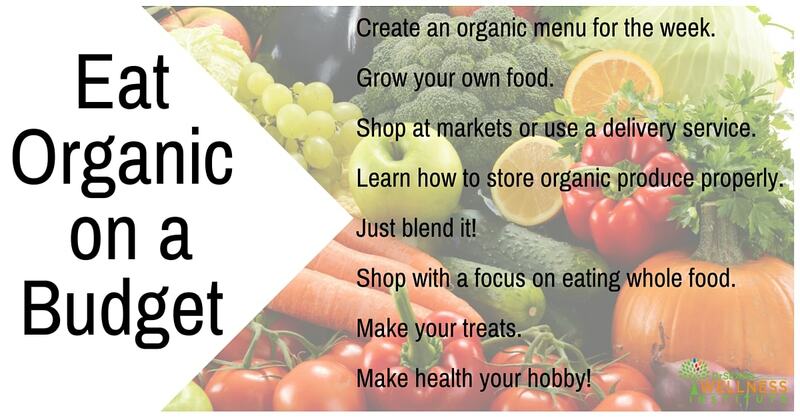 With so many of us struggling to make ends meet, how is eating organic on a budget possible? It is attainable, and rather than buying skids of Mr. Noodles or Kraft Dinner to get by, use the tips below to help your family enjoy some extra pocket money without compromising a life of vibrant longevity! Create an organic menu for the week. It does take time, but we need to begin seriously prioritizing food preparation into our lives. Museums and other attractions are often packed on weekends anyway — as a family why not avoid that hustle and bustle and devote one day on the weekend to menu and organic food prep? Get the kids involved as much as possible and make it fun! Our family has two organic gardens, a community plot nearby (unfortunately it has taken us 3 years to get good enough at gardening to yield a decent crop), and we have our Tower Garden on our balcony. The Tower Garden is much much easier than traditional gardening due to its aeroponic technology (it is grown vertically with the roots hanging into a funnel that is showered with its food). We like our organic plot for our root veggies, and our Tower Garden for our lettuces, kale, Swiss chard, cherry tomatoes, and peppers. There is nothing like produce pulsing with vibrant life that you cut for immediate use in your meal. There is also nothing like having your children excited about growing their own food and learning about that process. The best part is crunching the numbers as you learn that you are saving anywhere from $90-$140 per month on your organic produce during growing season! Shop at markets or use a delivery service. The best price on organic produce is when you can shop from the farmer directly, but that is not possible for everyone. In the dead of winter in areas such as ours where we can’t grow food from October-April, our delivery basket has saved us. It makes eating organic on a budget much easier, and also quite convenient as it comes to our door. For our family we pay $45 per week on an array of organic produce. The service we chose comes with a recipe guide which is a huge highlight for me, as it helps me a great deal with menu planning and ensuring I use it all. Learn how to store organic produce properly. Celery- wash and then wrap in a chamois or paper towel, put in a large Ziploc bag with air squeezed out. Store in fridge. Most greens (lettuce, kale, herbs etc. )- wash and then dry in a salad spinner. Wrap in a chamois or paper towel, put in a large Ziploc bag with air squeezed out. Store in fridge. Tomatoes- Only buy as many as you can eat within a day or two. Keep out at room temp sitting upside down (stem down). Potatoes- Keep in a cardboard box or paper bag, and check them often for ones that are starting to sprout or spoil so you can remove them so as not to spoil the bunch. Apples, oranges, pears- in your crisper drawer. Keeping fruit like this in a bowl may encourage you to eat more, however they only last a few days this way, so only put out what you plan to eat that day. Bananas- “de-bunch” them, and wrap plastic wrap on just the stem to keep them from browning fast. I also like to peel and freeze ripe ones so they can easily be thrown into smoothies or thawed later for baking. Avocados- usually the challenge is getting them to ripen (which you can do by putting them in a paper bag with an apple). But to save a half avocado for later, you can squeeze lemon, lime or vinegar onto it and put in a container in your fridge. Berries- Wash in a mixture of 1 cup white vinegar to 3 cups water, swirling in a bowl to clean them off gently. Drain, rinse, and dry them well. Then you can re-use the container they came in, lined with chamois or paper towel. This really extends their life and also makes them ready to enjoy at a moments notice. Frozen fruits and veggies- Always have some frozen organic fruits and veggies on hand to eat at a moment’s notice just in case. Again, a huge part of the expense with groceries is in the amount that is wasted. Soups and smoothies help make eating organic on a budget possible by using every last morsel. If you juice, you can even use the remaining pulp for inclusion in your muffins for added fiber. Shop with a focus on eating whole food. Try to remain in a perimeter of the grocery store, and if you can, shop twice a week so that you are eating as fresh as possible, buying only what you need. Buying in bulk online is another big money saver for eating organic on a budget. Nuts, seeds, beans and dried fruit are all great foods to buy in bulk because they will stay fresh for a very long time. It is critically important to buy any animal products organic, due to the multifaceted risks they present with not just pesticides, but also hormones and antibiotics. So another way eating organic on a budget is possible, is to reduce your consumption of animal products as these tend to be more expensive than plant based foods as well. Make your own cookies, muffins, etc. to save loads of money and to know what is inside them. Most packaged foods are laden with chemicals to keep them on the shelves longer and to trick your taste buds to hook you on the product. Lastly, Dr. Sears advises to “make health your hobby”, and this is so wise. If you take an interest in seeking out health lectures by your local L.E.A.N. Coach, watch documentaries about healthy eating, and pick up books (NOT fad diet books though! A good list of recommended reads can be found here)- you will be motivated to try eating organic on a budget. I promise you will not regret it! Brandie Hadfield is a wife and mother, Speaker and Coach. Certified through Dr. Sears Wellness Institute, Brandie offers her coaching in Toronto, Canada. Brandie has also partnered with Bebomia to offer holistic wellness solutions to sleep-deprived parents, encompassing the four pillars of health: lifestyle, exercise, attitude and nutrition. Prior to becoming a Dr. Sears Coach, Brandie worked as a Human Resources Manager in the fitness industry where she helped leaders motivate and retain their staff. The journey into motherhood transformed how she lives her life, and she is passionate about coupling her education and experiences to help families achieve their dreams of healthy balanced living.